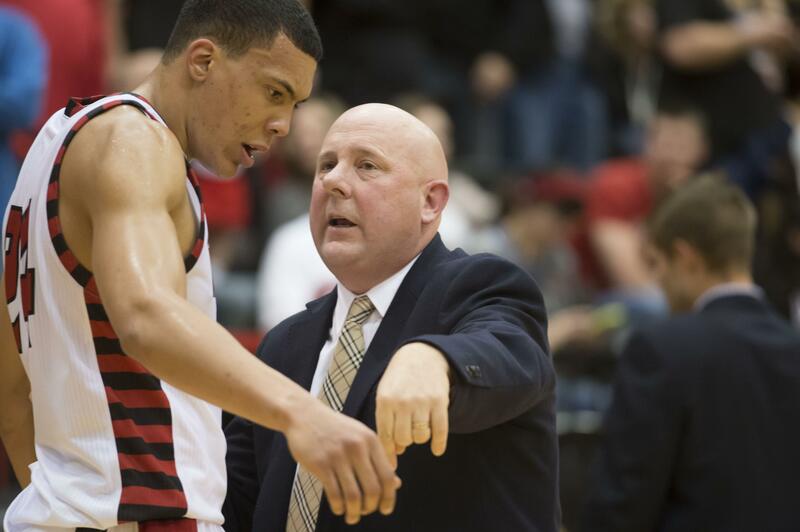 Eastern Washington basketball coach Jim Hayford going to Seattle U. UPDATED: Wed., March 29, 2017, 3:41 p.m.
After leading Eastern Washington to its most successful three-year run in history, basketball coach Jim Hayford is moving on. Hayford confirmed via social media on Wednesday that he will be the 16th head coach at Seattle University. He was expected to be introduced later Wednesday in Seattle. “I am grateful to take this next step in the journey of life and to coach at Seattle University,” Hayford said on Twitter. “A special thank you to all my EWU players,” Hayford added. Together, Hayford and his players carved out a record-breaking three seasons at Eastern. In 2014-15, his fourth year since moving from Division III Whitworth, Hayford led the Eagles to only their second trip to the NCAA Tournament. Over the past three years, Eastern has won 66 games, easily the best stretch in Eastern’s 33-year history as a Division I school. The 49-year-old Hayford was 106–91 (.538) during six seasons at Eastern Washington. This season, the Eagles finished 22-12, including two wins over Seattle University. They were second in the Big Sky at 13-5. After eight-year coach Cameron Dollar was fired on March 13, Hayford was one of five finalists for the job. Reportedly, the field included Ken Bone, the former head coach at Portland State and Washington State. Seattle U. has a rich history, including 11 appearances in the NCAAs. The 1958 squad, led by future NBA star Elgin Baylor, reached the title game in 1958 but lost to Kentucky. From 1960–1969, Seattle produced more NBA players than any other school. However, the Redhawks haven’t reached the NCAAs since 1969. Seattle later moved its program down to the NAIA level before upgrading again in several stages. The Redhawks returned to the Division I ranks again in 2009 and hired Dollar, a former UCLA player, later that year. Seeking conference affiliation, the Redhawks were rejected by several leagues, including the Big Sky Conference, before joining the Western Athletic Conference as a non-football member. Seattle plays its games at Key Arena. Published: March 29, 2017, 12:02 p.m. Updated: March 29, 2017, 3:41 p.m.